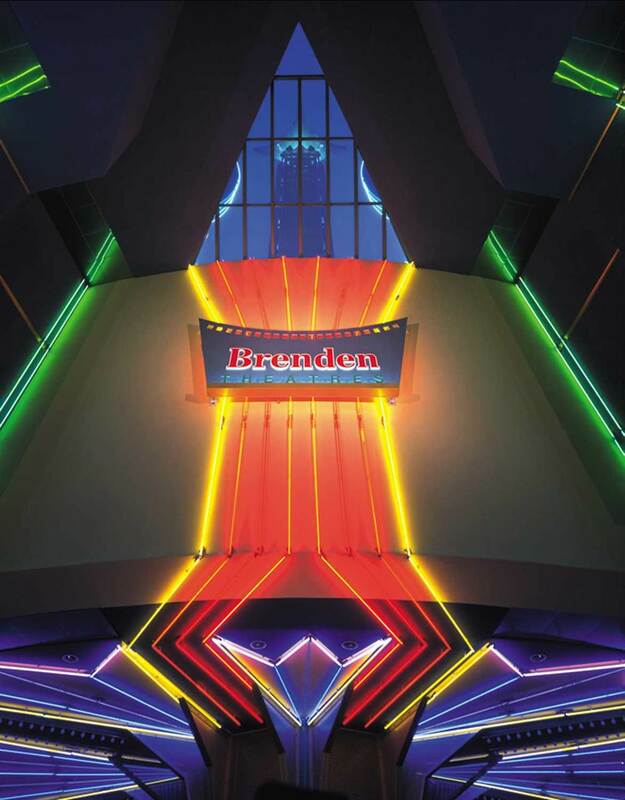 Brenden Theatres Modesto — Behr Browers Architects Inc. This 18-plex-stadium theatre was designed for Brenden Theatres as part of a revitalization effort for downtown Modesto. The project integrates 6,000 square feet of street fronting retail area with 101,000 square feet of theatre area. The building is constructed of integral color concrete block with some EIFS covered exterior walls. One of the project requirements was to help draw people back to the downtown area. 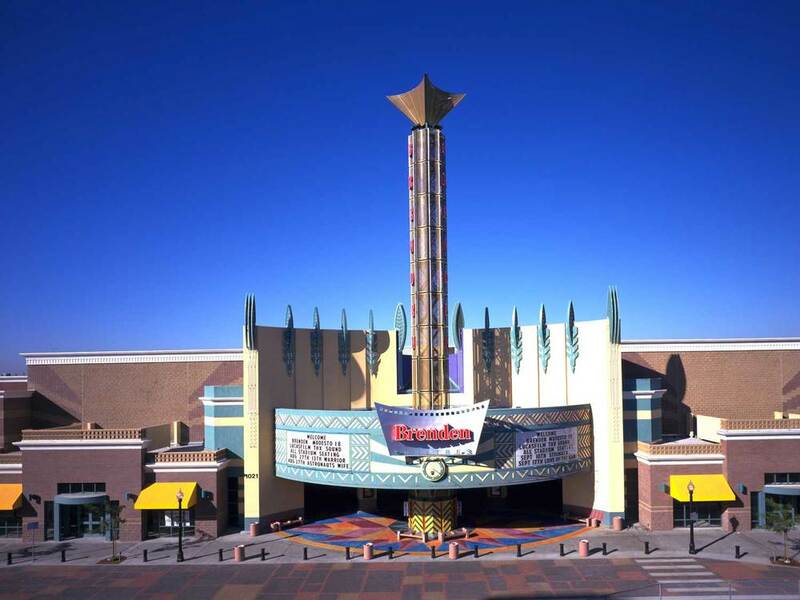 To accomplish this, the distinct tower element was used to beacon patrons to the theatre entrance under the marquee and canopy, which are reminiscent of the old-time theatres. 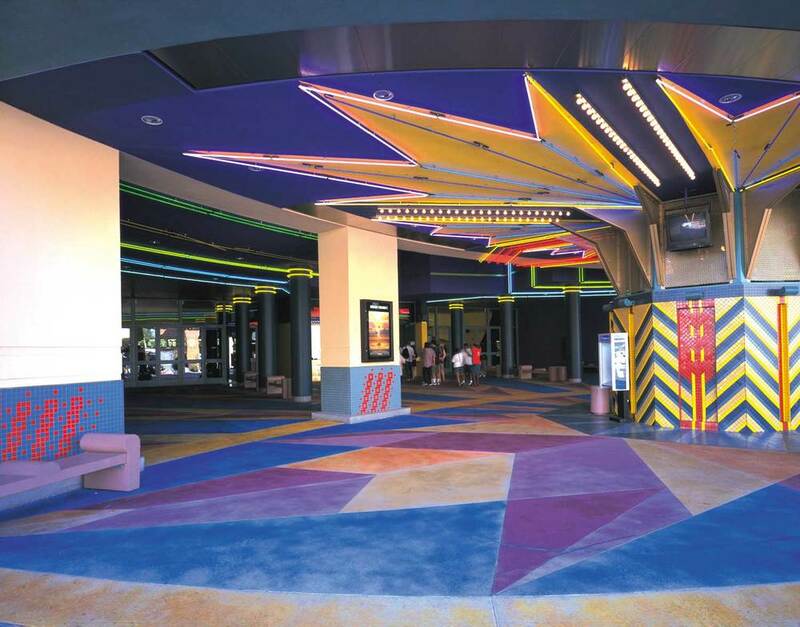 The entry also features brightly colored concrete flooring and tiles, and neon fluorescent painted surfaces. The combination of brightly colored materials, neon and lighting throughout the project give the theatergoers an energized experience. Another draw to attract patrons was to design all 18 auditoriums to offer great viewing with exceptional sound through state of the art auditorium design, including stadium seating, THX sound systems, large curved screens, large comfortable seats with cup holders, and full disabled access. This movie theatre with retail space has successfully fulfilled its goal of helping to bring activity back to an underused downtown area. The theatre has many features designed into it to attract patrons, such as the marquee and canopy and the 100'+ historical yet “high-tech” tower. The entry is composed of highly concentrated colors and dramatic lighting to add excitement back into the theatre going experience. 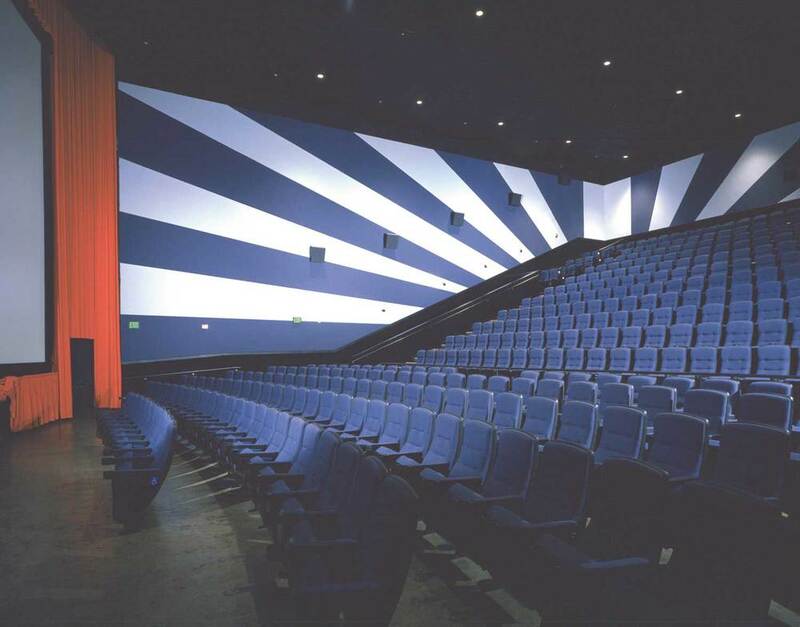 The bright colors are carried throughout the project, only subdued in the auditoriums where the movie screen becomes the focus. The theatre expresses dynamic design, not just at the exterior, but also in every aspect of the project. The theatre is also successful in its integration with the surrounding brick retail buildings by using brick-like blocks and by reducing the scale of the retail portion of the project. This helps this large theatre to be more pedestrian friendly. All these successes are due to the high quality of design and workmanship of all parties involved.